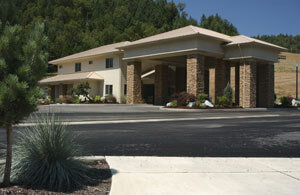 The Seven Feathers RV Resort is open 365 days a year, 24 hours per day. The resort has an on-site, live-in manager who resides in a 1500 square foot home on the upper level of the Administration Building. As shown on the plot map, the resort straddles Jordan Creek and has 200 pull through spaces with 151 of its spaces north of Jordan Creek, and 49 spaces south of Jordan Creek. 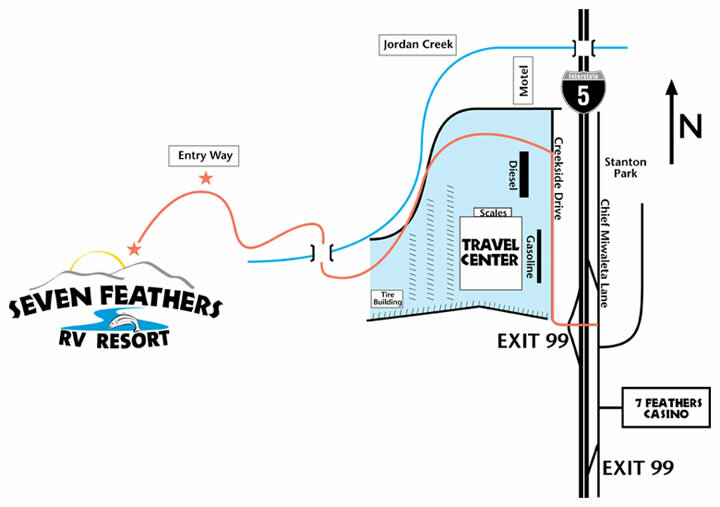 exit 99, past the Seven Feathers Hotel & Casino Resort, turn left under Interstate 5 and then go north around Seven Feathers Truck and Travel Center. Each pull thru parking space in the Seven Feathers RV Resort is a level concrete space measuring 12 feet wide by 75 feet long. 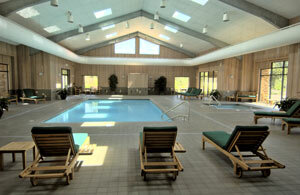 Each separate space has its own full line of amenities as follows. 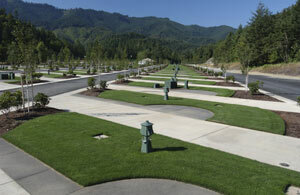 When you step out of your RV, you will be greeted with a concrete walkway, not mud, in the winter. Covered BBQ area that seats 150. The famous Seven Feathers Hotel & Casino Resort and its award winning Camas Room restaurant are but a short less than ten minute, free shuttle ride away - to the front door! There are free hiking trails in the Jordan / Alder Creek watershed. There is a "kids only" fishing pool below the dam. Canoeing / kayaking / boating / fishing on the nearby South Umpqua River. The historic Douglas County Museum is 20 miles north on Interstate 5.